Recommended maps for this route: Sawbill Area West, Fisher F-5, F-11 and F-12 or McKenzie Map 7, 8, 20 and 21. Pack up and put in at Sawbill Lake. Head west through Alton, Beth and Grace to Phoebe Lake. After July 1, small mouth are very easy to catch on Alton and Beth. Take the longer portage between Beth and Grace rather than the two shorter ones through Ella. 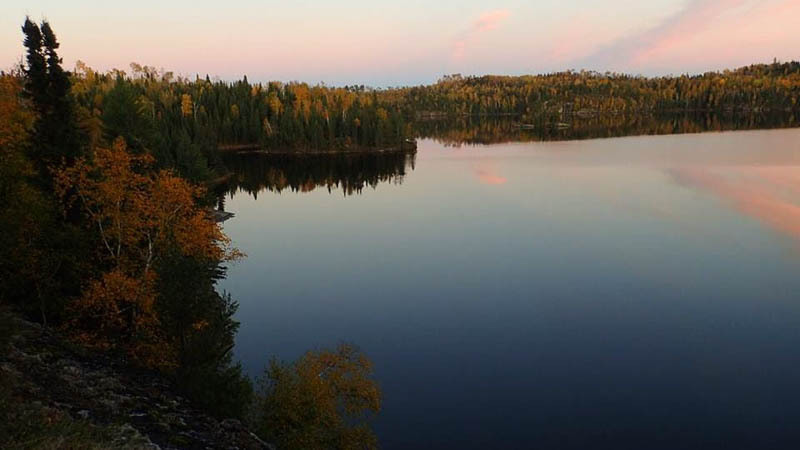 Grace and Phoebe are two of the finest walleye and small mouth lakes in the Boundary Waters. The little rapids between Grace and Phoebe are too small to be navigable. Be sure to hike into these streams off the portages, though, for some gorgeous scenery. After the first trail breakfast, paddle north into Knight Lake and then take a series of good portages through Hazel Lake and the Phoebe River into Polly Lake. Polly is very popular for walleye fishing, so sometimes it can be tough to find a campsite. Go three more portages into Koma Lake, where the fishing is just as good, but the people are fewer. Leave camp set up and grab your food pack for a day trip down the Kawishiwi River. The short stretches of whitewater have portages around them. Do not attempt to shoot these rapids! The Kawishiwi River has a long history of human visitation. It has been used by Native Americans for thousands of years. Many ancient artifacts have been discovered by archeologists here. Plan for lunch on Fishdance Lake where you can view the ancient pictographs on the cliff face on the north side of the lake. Take the east arm of Malberg to the Kawishiwi River. Throw a lure in the pool at the end of the rapids and don’t be surprised if a northern or walleye strikes! Eat lunch on Makwa Lake. Some daring people jump off the cliffs on the northwest shore into 60 feet of cold, clear water. A short afternoon of canoeing and portaging will bring you through Elton Lake into Little Saganaga. Every campsite is a good campsite on Little Sag! Go into Mora and turn south through Whipped, Fente, and Hub. This is a lightly traveled route where you stand a good chance of seeing wildlife. Camp for the night on Mesaba. Take a hike through the virgin forest to Leah Lake and look upon a lake that only a handful of people have seen. In late July and early August, the blueberries are thick along the east shore of Mesaba. Continue south through Hug, Duck, and Zenith Lakes. Watch for blue herons, jack snipe, western painted turtles, and carnivorous pitcher plants in the floating bog between Lujenida and Kelso lakes. Plan an hour or two of small mouth fishing on Alton if you want to take some fish home on ice. A short paddle down Sawbill completes your trip and a memory you can keep for a lifetime.